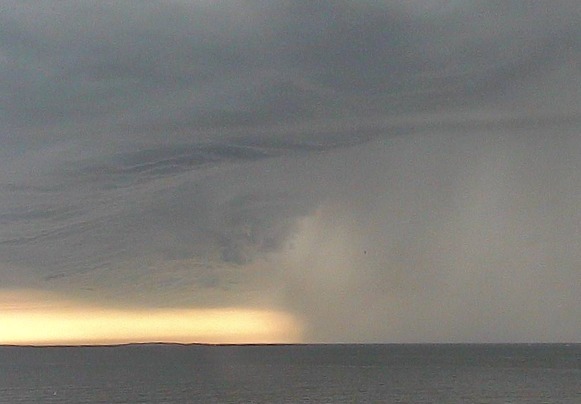 A powerful storm cell enters Buzzards Bay Saturday, July 23, 2011. Looking closely at the front line of cloud formation in this strong thunderstorm, a wall band of heavy showers (right) appears to be right behind the early stages of a developing funnel cloud right off Wilbur's Point. This is as far as it got. The photo warrants further scrutiny and discussion. WIWS South Point Axis Cam looking southwest from West Island towards Cuttyhunk.